I wake up early in the morning of Day two, still reeling from a day of disappointment. 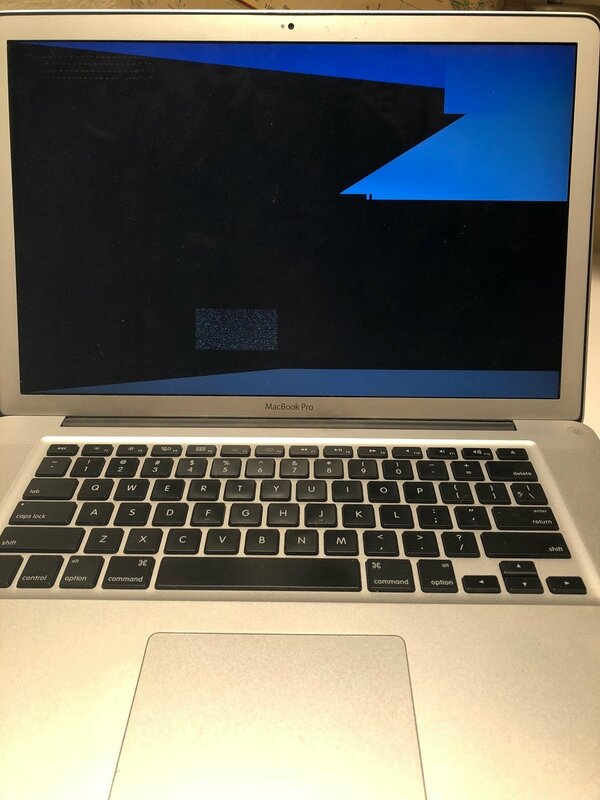 I try to turn on my computer to write my recap of Day One, only to find a glitched screen of blue and black. Like a prehistoric woman, I return to the Stone Age and write my blog post by hand. I wasn’t even sure I could use a pencil anymore, but luckily my muscle memory carries me through as I wait out the MacBook rainbow spinning wheel of death. Technical difficulties will not keep me from discussing my Burger journey. The world needs to know the TRUTH! By the time my computer functions, it’s already time for me to go to my first burger destination. I risk falling behind schedule if I wait any longer, and I still haven’t picked my first Burger Week spot of the day. With yesterday’s lowly two burgers, I’m even more determined to get myself back on track. My mom tries to change out of her workout clothes to “look presentable” but I tell her there’s no time (and honestly, no point). This is Burger Week for god’s sake! Every minute wasted is potential for the dreaded burger sellout. We burn rubber until we make it to Danwei Canting. My mom is horrified by my driving, but there’s no time to lose – we have burgers to eat. We arrive at 11:37 am, seven minutes behind schedule, but I let it slide because there’s no line, and my mom is a Burger Week rookie. We order our burgers, and I introduce her to Nick and Keith. Immediately, we begin discussing burgers, while my mom is fascinated by her “behind the curtain” glimpse into the life of Burger Week veterans. We’ve become professionals in strategizing burgers, I forget what it looks like to an outsider. Nick tells us he’s already eaten 11 burgers. I’m struck with a tinge of jealousy because I’m so far behind. It only fuels my conviction to eat as many burgers as possible while I’m in town. Our burgers arrive, and to my delight, they are very small. This means I can eat more burgers throughout the day, instead of stopping at one lunch burger. My mom is a fast learner, and she immediately begins detailing the flavor profiles. I’m extremely proud, as if I’m watching a child successfully learn to ride a bike for the first time. Danwei Canting "Spicy Tails & Trotters Pork Burger"
The Danwei Canting “Spicy Tails & Trotters Pork Burger” has fermented cucumber, Napa cabbage, Chinese mustard, with a spicy blend of chilies and Sichuan peppercorn. The burger has good flavor. The Chinese mustard is an excellent touch, as it adds an extra kick that is subtle, but still enhances the complexity of flavors. It’s seasoned well, but unfortunately the patty is a bit dry and overcooked. It can be remedied with the special Danwei Canting sauce provided on the table, but as a result I rate it a 7/10. We part ways with Nick and Keith and move onward to our next burger destination. We planned to go to Fifth Quadrant because I'm a real sucker for goat cheese, but Nick and Keith both gave me an “Ehhh…” shrug, so we steered clear. We decide to give Portland Burger a shot, since I’ve never been there. In my mad rush, I forgot to take the Downtown Portland lunch crowd into consideration. Huge mistake. We walk inside and the line is almost out the door, and moving slowly. My mom is game to stay in line, but as a Burger Week expert, I know we’re wasting precious time. I frantically search the map to find another location nearby, and land on Senate. We walk a few blocks and I’m relieved to find some open tables. Senate took over the old Thirsty Lion, so I’m filled with weird memories of the days when I turned 21 and the Downtown bars were “cool”. The Senate “Hot Mess” burger is a fitting description – it’s mayhem. It features a grilled patty on a brioche bun with housemade cheese and BBQ sauces, piled with fried onions. Senate is the only place thus far that has nailed the sauce to burger ratio. While it was edging on “too much sauce” it provided a lot of great flavor. The BBQ sauce was different from a typical BBQ sauce with an added extra kick. However, it desperately needed a more robust bun to hold it all together. Overall I rate it an 8/10. Originally, I planned on hitting TILT for breakfast because it’s one of the only Burger Week locations open at 7am, but Nick warned me he tried to go in the morning, and it was closed. Both Keith and Nick told me the TILT burger was a “must have” so I decided to make my way to their new Southeast location. 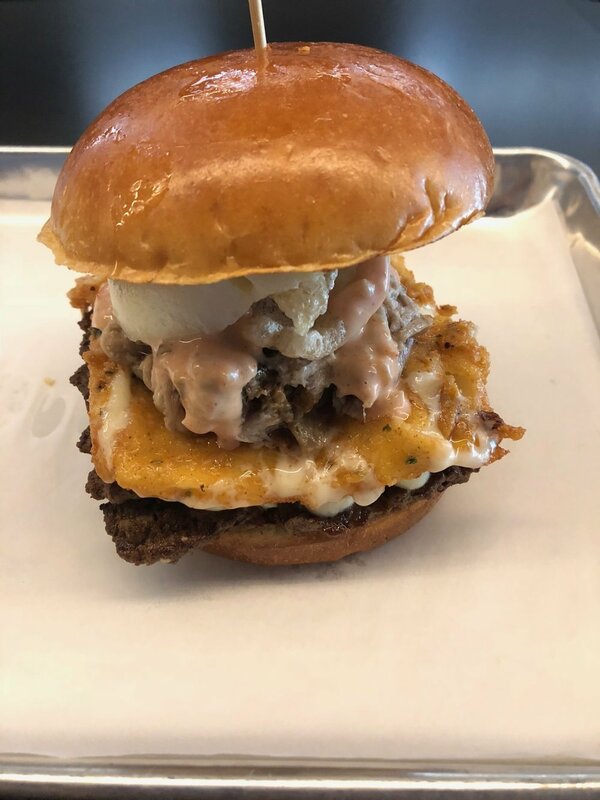 TILT’s burger is a monstrosity of not one, but TWO beef patties, pork belly, chicharrones, an egg, and (brace yourself) fried MFing cheese. Yes. FRIED. CHEESE. The first bite is incredible. It’s quite literally an explosion of flavors – there’s parts leaking everywhere. But I don’t care, I’m in heaven. They have towels for napkins and I soak through two. I can feel the inevitable stomach ache approaching. I can feel it destroying my body. But each bite brings me closer to nirvana. In a truly serendipitous moment, Drake’s “God’s Plan” starts playing on the speakers. It really does feel like this burger is part of God’s Plan. I feel the groove, taking each bite on beat, like a beautiful choreographed dance. I envision the iconic scene in dirty dancing where the burger runs towards me and I perfectly lift it into the air. TILT always has an excellent burger year round, but this Burger Week did not disappoint. In the holding pattern of average burgers, Piggy Walls became my savior, reminding me why I spend an entire week passionately eating as many burgers as I can. In retrospect, I’m so thankful I didn’t try to eat this burger in the morning. It nearly killed me, but that’s the thrill of Burger Week; toeing the line of potential heart attack and clogged arteries is what feeds my adrenaline. I rate it a high 9.5/10, one of my highest rankings of all time. I walk to my car and realize my glasses are covered in greasy fingerprints. The consequences of the TILT burger start settling in. I can barely walk, I feel so weak. I find myself at a burger crossroads. To make up for yesterday’s lost burger time, I know I NEED to eat another burger, but I’m not sure I can stomach it (literally). I scroll through the list, looking for pictures of the smallest possible burgers, and settle on East Burn. It looks like it could be slider-sized. Unfortunately, I drive past, and find a huge line out the door. I consider giving up, since I’m so full. But then I realize, this is a test. I can’t give up, not during Burger Week. It’s not over until I’m in the fetal position with the meat sweats. I decide to pull myself together and find the next nearest burger. Nick said the Smokehouse Tavern burger was worth a taste, so I give it a shot, knowing nothing about the ingredients. There’s another line of people waiting, but this time I’m determined to persevere. Luckily, since I braved this burger alone, I have no trouble slipping into the last seat at the bar. At this point, the TILT burger stews in my stomach, and I can hardly hold myself upright. I order my burger, and can barely get the words out without feeling like I’m going to throw up. I’m pretty sure I just said, “ME WANT BURGER WEEK” like an unruly cavewoman. 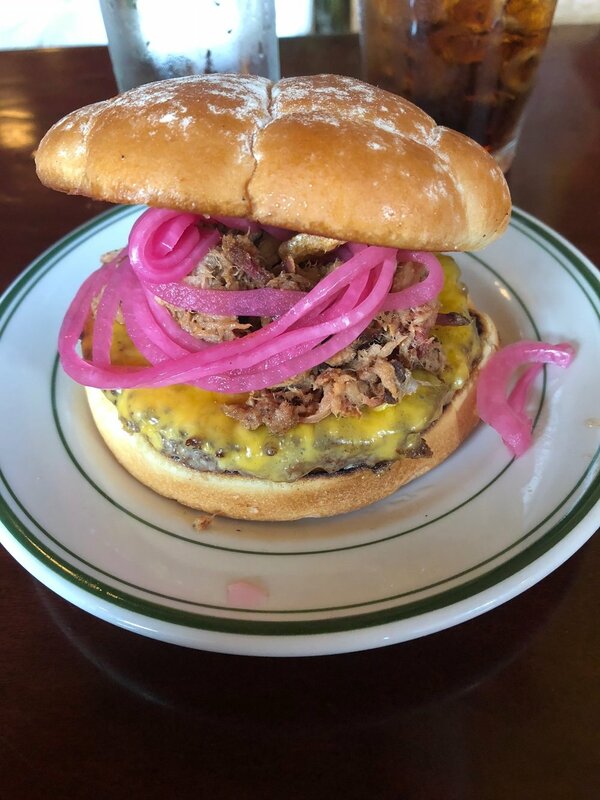 The Smokehouse Tavern “Pulled Pork Torta” consists of a burger patty, pulled pork, chicharon, whipped avocado, and pickled onion, on a potato bun. Smokehouse Tavern "Pulled Pork Torta"
My burger arrives and it’s at this moment I’m hit with the realization that I’m eating back to back beef patty/pork/chicharron combos, and I’m full of regret. I've made a huge mistake. The meat sweats kick in, and I’m physically incapable of swallowing my burger. I’m trying my best to eat it, but it’s like the scene in Bridesmaids when Kristen Wiig's character gets food poisoning but she’s trying to keep her cool. The bartender keeps coming over to check on me, and all I can muster up is some basic mime actions, even though internally I am FAR from a “thumbs up”. Although Smokehouse Tavern had an unfair disadvantage due to my body falling apart, it was actually a very good burger. The whipped avocado is what makes this burger sing. Pickled onions also offer a nice touch, and the chicharron adds nice dimension and texture. Overall, I rate it an 8.5. I drive to my friend’s birthday party, burger drunk and disoriented. I haven’t seen them in six months, so upon arrival, they try to greet me with hugs. But I have to dodge them, as it’s too much constriction on my digestive system. Instead, I keel over into the fetal position. This, paired with my fit of meat sweats, is the inevitable signal that it’s time to tap out until tomorrow. But even in my pathetic state, I thank the burger gods for delivering me a brighter day of burgers.